사뮈엘 드 샹플랭(Samuel de Champlain, 1567년 8월 13일 ~ 1635년 12월 25일)은 17세기 프랑스의 지리학자, 탐험가 및 지도 제작자이다. 프랑스 왕 앙리 4세의 의향에 따라 퀘벡 식민지의 토대를 마련했다. ‘누벨프랑스의 아버지’로 불린다. 그는 오늘날의 샤 마리 띠모 브루아쥬(Brouage)에 태어났다. 태어난 해는 1567년이라는 설과 1570년이라는 설이 있다. 1603년 종종 캐나다의 프랑스령 ‘누벨프랑스’(Nouvelle France)에 입국했다. 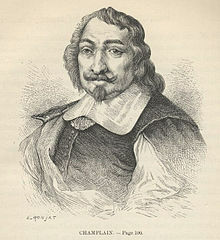 1604년에는 피에르 뒤구아, 쉬르 드 몽(Pierre Dugua, Sieur de Monts)과 함께 식민지 활동을 시작했다. 1608년에 다시 누벨프랑스로 가서 세인트로렌스 강 유역의 퀘벡 식민지(현 퀘벡)를 마련했다. 1635년 퀘벡에서 사망했다. 월드 디지털 라이브러리 presentation of Descripsion des costs, pts., rades, illes de la Nouuele France faict selon son vray méridienor Description of the Coasts, Points, Harbours and Islands of New France. 미국 의회 도서관. Primary source portolan style chart on vellum with summary description, image with enhanced view and zoom features, text to speech capability. French. Links to related content. Content available as TIF. One of the major cartographic resources, this map offers the first thorough delineation of the New England and Canadian coasts from Cape Sable to Cape Cod. 이 문서는 2018년 12월 24일 (월) 06:16에 마지막으로 편집되었습니다.